I thought Korean skincare had revolutionised clay masks when it made them bubble. That was just a gimmick. Those bubbling clay masks do their usual basic job – you know, remove excess oil from skin – but with foaming special effects (truth bomb: just because you can see it doing something, it doesn’t mean it’s doing something good for your skin). The true disruptor of clay masks is Niod (who else?). Niod Flavanone Mud takes clay masks on a whole new level. It decongests skin in three phases: it purifies skin, protects it from environmental aggressors and reduces inflammation. At least on paper. Let’s take a look at what the science says and how it performs in real life. Ready? A.k.a. the basic job of a clay mask. This phase uses clays like montmorillonite and kaolin to absorb excess oils and surface impurities (clays can’t detoxify pores!) from your skin. Absorbing excess oil makes skin less shiny and prevents the clogged pores that inevitably lead to breakouts. P.S. The mask also has its fair share of humectants (think glycerin & co) to hydrate skin, preventing it from getting too dry during the oil absorbing process. Alteromonas Ferment Extract: a polysaccharide from microorganisms living in the Polynesian coral reef, it’s involved in responses to environmental stress and reduces inflammation. Resveratrol: a powerful antioxidant that destroys the free radicals that cause wrinkles and dark spots. I rarely see antioxidants and soothing ingredients in clay masks so I’m thrilled Niod chose to supercharge the mask with them. 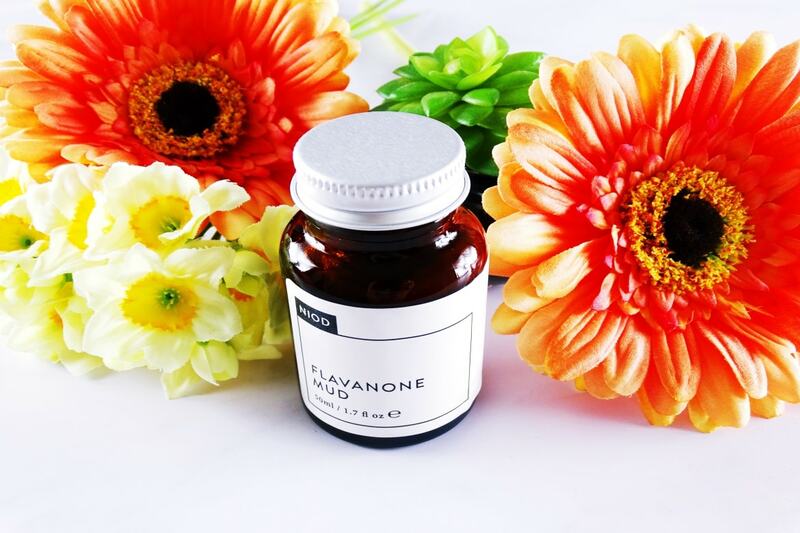 Flavanone: listed as Naringenin on the ingredient list, it’s a powerful antioxidant derived from citrus fruits that fights wrinkles and reduces inflammation. Modified oleic acid: an acid naturally produced by your skin that helps it to keep it moisturised and soothes inflammation. I hate using clay masks. There, I said it. You always have to use A LOT of product to cover your entire face. As that thick layer of mud dries, your skin feels SO tight and uncomfortable. And don’t get me started on removal. SO. MESSY. Masks are a pampering evening ritual for me. Cleaning the sink afterwards is NOT pampering. Unless my skin is way oilier than usual, I just can’t be bothered. That’s in the past. Phew! Niod uses a new dispersion mechanism that allows you to apply way less product. You only need a very thin layer to cover your entire face. No joke. It feels way more comfortable on the skin. It’s way less messy to remove. And you don’t waste so much product every time you use the mask. The best part? Because the mask dries much faster, all those goodies above that need to penetrate the skin to perform their magic have the time to get into your skin before you take the mask off. Why had no one come up with this technology before? I can’t think of going back to using a normal clay mask ever again. Cleanse skin and towel dry it. Apply a think layer Flavanone Mud on clean, dry skin. Rinse it off. Warning: you may experience stinging. This is normal. Once a week is enough even for oily skin. Niod Flavanone Mud is a dark terracotta shade with a smooth texture that applies like a dream. You really need very little and, as it dries, it never feels uncomfortable or dry. I also kinda like the spicy cacao scent but it doesn’t linger long. That’s how the ingredients smell like, by the way. Niod didn’t add any fragrance to the mask. My skin rarely tingles, even when I use high doses of vitamin C. But when I took this off, I did feel the tingling sensation Niod warns you about. It wasn’t painful and lasted only a few seconds. But if you’re experiencing it too, don’t freak out. It’s totally normal. The first time I used it, I didn’t see much of an improvement. My skin looked like it looks after any clay masks: less oil, less shine, smooth skin texture. You know the drill. It’s with regular use that this mask truly shines. After the second use a week later, I noticed my skin looked a bit brighter and overall healthier. By the fourth use, I noticed a much bigger difference. My skin was softer and brighter and blemish-free. So don’t get discouraged if you don’t see a huge transformation straight away. This needs time and commitment to improve the look and health of your skin. Clay masks used to be a necessary evil whenever my skin single-handedly decided to pump out too much oil. Now they’re a true pampering ritual (finally!). I can’t wait to use it again. Niod Flavanone Mud has a thin, smooth texture that doesn't feel tight and uncomfortable as it dries. In the short term, it helps absorb excess oil. In the long run, it makes skin healthier and brighter. Have you tried Niod Flavanone Mud? Share your thoughts in the comments below. Is Ziip Beauty Nano Current Device Worth The $500 Price Tag? It sounds good, but I never tried a NIOD product. The web site just confuses me. Susan, I think Niod is one of the best skincare brands out there. But I agree, their website is super confusing! I tried this mask some time ago and I thought it was great. In fact, it’s the ONLY Deciem product that I think does anything at all. Everything else I bought from them just sat on my face. I stopped using the Flavanone mask until I read your post and decided I should be using it. Now my skin is burning so badly, I’d go to the hospital if I could! I even put their Sensitive Fix on (I don’t know why, it’s never done anything). I’ll try Dr Jart’s Cicapair serum next, this is really unpleasant! Polly, oh no I’m so sorry to hear this! Have you changed anything in your skincare routine lately that may have increased its sensitivity? Like, upped your retinol dose or had a glycolic acid peel? Help me out with some nomenclature, please? If something “decongests” skin, how will I know? What is “congested” skin? “Congested” means “crowded,” or in the case of our noses, “stuffy.” What does it mean when applied to the skin? Also, something which “detoxifies” our skin by definition removes toxins. What toxins are these? And why don’t we have a system to “detoxify” our skin the way we have a liver to deal with keeping our internal systems clean? I’ve always assumed these are marketing buzzwords, but you deal with skin science, so I assume you can straighten these out for us. Thanks very much! Hi Binky, yes these are marketing buzzwords. Skin can’t detoxify itself and you can detoxify it with skincare. It’s your liver and kidney that do the detoxifying job. So when you hear a skincare brand making this claim, ignore it. I guess in the world of skincare decongested means that it can unclog the pores. But again, there’s not a standard definition so a lot of brands can use it to mean everything and nothing. The new skincare trend seems to be anti-pollution skincare, hence where all this stuff is coming from. But having a healthy liver and cleansing your skin every night are your best detoxifying/decongesting weapons. Purchased this product on your recommendation and am so glad I did. I was able to shop in store armed with a list of products I was currently using and looking to match with NOID. Discussion with the sales rep was very informative, but you do need to know your stuff, how your skin reacts, what you use etc as there is a lot of technical info to consider. Sales rep recommended using the mask for 5 days to start and then go to once a week. I have fairly oily skin and it can really stand up to anything I try on it (Vitamin C, Retinal, etc…). This is only day 2 but my skin already feels and looks great morning to night. Thank-you for the recommendation and scientific explanation I may toss all other masks in my cabinet as they just feel frivolous now!